In 1976, Dr. Ralph Mann completed his studies for his Ph.D. in Biomechanics by submitting his dissertation titled “A Comprehensive Computer Technique to Process Human Motion Data”. Using a common jumping action, the technique was designed to maximize the motion by estimating the potential maximum human effort possible, then predicting the simulated result. Film a large number of elite athletes performing the movement of interest. Follow the body motion of each athlete by digitizing the athlete’s performance into a computer. This entails telling the computer where each of the body segments, along with any implement (golf club, bat, etc. ), was located during each frame of the performance. Employ statistics to determine the maximum human effort possible for each of the body segments. Using these values, build a performance Model using the Modeling techniques that were further developed from his dissertation. Initially, a crude ten segment stick figure Model was employed to produce the simulations. The resulting animations, in every sport, were so visually appealing that Dr. Mann began using the results to demonstrate the potential future performance of each spot action. In addition, the modeling efforts pointed to the conclusion that every athlete in the elite group were performing their movements very much like every other athlete in the elite group. There were obvious differences due to body build and individual idiosyncrasies, however, these were minor when they were accounted for. Since its inception, the stick figure Model has evolved into a three dimensional, multi-segment entity. More importantly, in the process of attempting to use the Model to show students how they can swing more like the best players in the game, Dr. Mann solved the problem of body size (and equipment) differences by having the Model adapt to the body size of any student. So, now the Model changes due to the differences of everything from the major influences like height to the small effects of something like shoe size. In addition, since most students cannot generate a Driver clubhead speed of 125 miles per hour, or sprint at 30 miles per hour, the performance speed of the Model can also be selected. Since each student’s Model matches their body (and equipment) size, it can be used to show the student how their performance compares to an elite performance. This process has been used to help students ranging from elite sprinters to beginning golfers identify where they stand when compared to the best in the world. And to show the comparisons, Dr. Mann combined video and computer graphics to overlay the model image on the actual performance of the student. This visual comparison makes it easy to see the performance differences, thus making the job of the teacher much easier. Not only can the student see where they have to improve when they start, but they can easily see improvement as they progress. The goal of the teacher is simply to move their student closer to their Model. The final evolutionary process of displaying Model results comes with 3D Humanoid Models. Using the skeletal frame that makes up the advanced stick figure, a humanoid figure can be added to make the simulated motion all the more realistic. 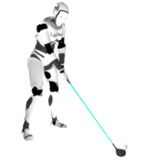 The SwingModel golf Driver performance is animated to the left. By incorporating the best movement patterns of the best PGA players in the game, this performance is superior to any of its parts. As a golfer, this modeling technique can be used to show you how you, with your body size, can swing like the best players in the game. Instead of trying to make you swing like a good player that cannot match your body size or swing speed, the SwingModel process can show you how to develop the best swing matched to your exact body dimensions and swing speed. ©2009 SwingModel. All rights reserved.